<h2>Avatar interviews and portable scanners to speed up border crossings</h2><br /><p>Anastasia Garbi from European Dynamics in Luxembourg is working on a system that uses facial recognition to begin screening people before they leave home.</p> <p>‘You can use what you have at home, a personal computer, without expert or specialised scanners,’ Garbi said.</p> <p>The idea is that travellers take pictures of their passport, visa and proof of funds and upload them to a website. Then, using a web camera, they answer questions posed to them from a computer-animated avatar border guard for a few minutes.</p> <p>That gives officials a series of facial images they can use to check against stored pictures from a passport or past entries and exits, a comparison that is much more difficult to copy than a fingerprint.</p> <p>‘Even a fingerprint is easy to imitate and cheat,’ Garbi said. ‘If you have a video capture, and you have some questions along with this, you get pictures of the reactions of the face of the traveller. This is very difficult to copy.’</p> <p>Research like this will help the EU make citizens safer by securing its borders effectively, without causing long queues and discomfort for travellers.</p> <p>The avatar is even capable of using facial biometrics (micro-expressions) to analyse the non-verbal behaviour of the interviewee and determine if the passenger is lying. The site then sends the inputs the traveller gives to a secure back-end system which calculates an aggregated risk factor, based on a comparison with the stored data and the expression analysis.<br /> <div class="quote-view quotesBlock quote_horizontal"> <div class="quotesTop"><img src="https://horizon-magazine.eu/sites/all/themes/horizon/images/quotes_top.png" alt="" title="" /></div> <p>‘Even a fingerprint is easy to imitate and cheat.’</p> <blockquote><p>Anastasia Garbi, European Dynamics, Luxembourg</p></blockquote> <div class="quotesBottom"><img src="https://horizon-magazine.eu/sites/all/themes/horizon/images/quotes_bottom.png" alt="" title="" /></div> </div> </p> <p>Those with a high risk factor can be flagged for greater interrogation, while those with a low risk factor receive a different classification.</p> <p>‘At the crossing point, those travellers with a low risk factor are asked to scan their passport for the system to give an automatic result to allow the crossing. Those with a high risk factor go for a more thorough automatic check, which includes scanning the documents with more advanced scanners, fingerprints and face matching as well as palm vein scanners. The new overall risk factor is calculated, and it is up to an agent to accept it or not,’ Garbi said.</p> <p>The privacy risk is monitored by researchers at the University of Hannover, in Germany, a project partner.</p> <p><strong>Handheld scanners</strong></p> <p>The work is part of the EU-funded iBorderCtrl&nbsp;project, which also plans to develop handheld passport and palm scanners capable of detecting millions of biometric reference points. They will even contain radar that can be used to detect stowaways in vehicles.</p> <p>The idea is that this technology will reduce the time that people need to spend at border crossings, while making sure they are thoroughly checked before entering the EU.</p> <p>Elsewhere, researchers have already created a working handheld scanning prototype that can perform security checks on the move.</p> <p>The EU-funded MOBILEPASS project, headed by the Austrian Institute of Technology (AIT) in Vienna, has developed a handheld device that can collect biometric data from a passport and scan passenger’s fingerprints and faces.</p> <p><img src="/sites/default/files/Facial%20recog%20scan_crop.jpg" alt="Secure biometric scans and thorough passport checks would take around 22 seconds with the MobilePass device, according to researchers. Image credit: MobilePass/ Michael W. Mürling" title="Secure biometric scans and thorough passport checks would take around 22 seconds with the MobilePass device, according to researchers. Image credit: MobilePass/ Michael W. Mürling" width="1200" height="800" class="@aligncenter@" /></p> <p>While some countries use automatic passport gates to check identities, there are many borders where it is not possible to install an electronic gate easily. The border may be too long, or it may involve checks on a train, for example. 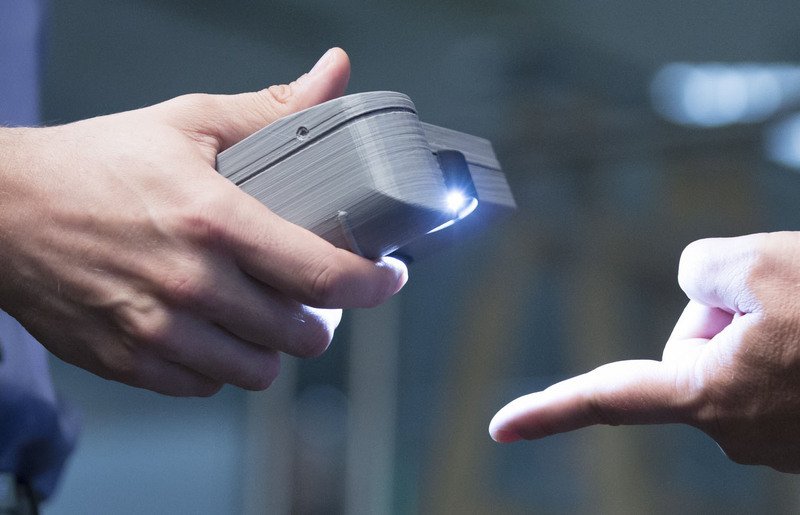 Portable scanners can make such crossings quicker and cover more territory.</p> <p>To do that, researchers made a device that can scan a finger just by having it held up in front of it, and securely transmit the data to a central database to compare a traveller’s fingerprints.</p> <p>‘If a third-country-national visa-holding person (for example from China) wants to enter the European Union, he ... has to make a visa so he gives his photograph and his 10 fingerprints which are centrally stored in the visa system,’ said project coordinator Bernhard Strobl.</p> <p>‘We are comparing fingerprints taken with a camera to fingerprints that have been taken with a flatbed scanner, and this was one of the biggest technical problems (to overcome),’ he said, explaining that the software must be able to adapt the image to recognise what is already on file.</p> <p><strong>Data security</strong></p> <p>The need to transmit data to a central database, both to access the secure biometric data on a passport chip, as well as to check visas, means it was important to have a device with enhanced security that could comply with European data protection laws.</p> <p>‘For EU citizens the fingerprints are on the passport, but to read it out the devices need special certificates from national control centres,’ Strobl said. That is not that hard to do, in theory even a smartphone could be adapted to read such chips, but that would lead to data security problems.</p> <p>This is because smartphones can be infected with software viruses that snoop on data or can be compromised to give up stored data. With the MOBILEPASS device, however, the data is encrypted in the device hardware itself.</p> <p>‘It is very, very unlikely that someone can break into the device. After programming the device with the key, there is no way to change the (decryption) key or read it out. Only the manufacturer has the knowledge to change the application,’ Strobl said.</p> <p><a href="http://bit.ly/newsalertsignup" target="_blank"><img src="/sites/default/files/news-alert-final.jpg" alt="Subscribe to our newsletter" title="Subscribe to our newsletter" width="983" height="222" /></a></p> <p>Using dedicated hardware, they can process fingerprints more quickly than a smartphone could, and it makes checks more hygienic because the procedure is contactless.</p> <p>‘The complete process, from inserting the passport, reading out the chip, making the facial verification, and doing one fingerprint verification is about 22 seconds.’</p> <p>In the future, the MOBILEPASS device could even be adapted with retina scanners to verify traveller identities using iris recognition, or infrared scanners to detect body temperature and flag those who may be crossing the border with an illness during monitoring of a public health epidemic. The ease of collecting such data portably offers possibilities to make borders more secure.</p> <p>Strobl says that passenger acceptance of such increased travel checks is all about matching speed with security.</p> <p>‘When you want to paint a picture for the future, you can say a free flow gate would be the best. Your face and iris (are) captured as you go through a gate, or hold up your finger. Biometrics at a distance.’</p> <p><em>If you liked this article, please consider sharing it on social media.</em></p> <br /> <img src=”http://www.google-analytics.com/collect?v=1&tid=UA-40077089-1&cid=avatar-interviews-and-portable-scanners-to-speed-up-border-crossings&t=event&ec=republish&ea=read&el=avatar-interviews-and-portable-scanners-to-speed-up-border-crossings&cs=republish&cm=republish&cn=republish&cm1=1" /> This post <a href="https://horizon-magazine.eu/article/avatar-interviews-and-portable-scanners-speed-border-crossings.html">Avatar interviews and portable scanners to speed up border crossings</a> was originally published on <a href="https://horizon-magazine.eu/">Horizon: the EU Research &amp; Innovation magazine | European Commission</a>. Being interviewed at home by a border guard avatar could be the first step in checking the identities of people who want to come into the EU from external countries, if researchers working on new technologies to speed up border crossings while maintaining security levels have their way. Those with a high risk factor can be flagged for greater interrogation, while those with a low risk factor receive a different classification. ‘At the crossing point, those travellers with a low risk factor are asked to scan their passport for the system to give an automatic result to allow the crossing. Those with a high risk factor go for a more thorough automatic check, which includes scanning the documents with more advanced scanners, fingerprints and face matching as well as palm vein scanners. The new overall risk factor is calculated, and it is up to an agent to accept it or not,’ Garbi said. The privacy risk is monitored by researchers at the University of Hannover, in Germany, a project partner. The work is part of the EU-funded iBorderCtrl project, which also plans to develop handheld passport and palm scanners capable of detecting millions of biometric reference points. They will even contain radar that can be used to detect stowaways in vehicles. The idea is that this technology will reduce the time that people need to spend at border crossings, while making sure they are thoroughly checked before entering the EU. Elsewhere, researchers have already created a working handheld scanning prototype that can perform security checks on the move. The EU-funded MOBILEPASS project, headed by the Austrian Institute of Technology (AIT) in Vienna, has developed a handheld device that can collect biometric data from a passport and scan passenger’s fingerprints and faces. While some countries use automatic passport gates to check identities, there are many borders where it is not possible to install an electronic gate easily. The border may be too long, or it may involve checks on a train, for example. Portable scanners can make such crossings quicker and cover more territory. To do that, researchers made a device that can scan a finger just by having it held up in front of it, and securely transmit the data to a central database to compare a traveller’s fingerprints. ‘If a third-country-national visa-holding person (for example from China) wants to enter the European Union, he ... has to make a visa so he gives his photograph and his 10 fingerprints which are centrally stored in the visa system,’ said project coordinator Bernhard Strobl. ‘We are comparing fingerprints taken with a camera to fingerprints that have been taken with a flatbed scanner, and this was one of the biggest technical problems (to overcome),’ he said, explaining that the software must be able to adapt the image to recognise what is already on file. The need to transmit data to a central database, both to access the secure biometric data on a passport chip, as well as to check visas, means it was important to have a device with enhanced security that could comply with European data protection laws. ‘For EU citizens the fingerprints are on the passport, but to read it out the devices need special certificates from national control centres,’ Strobl said. That is not that hard to do, in theory even a smartphone could be adapted to read such chips, but that would lead to data security problems. This is because smartphones can be infected with software viruses that snoop on data or can be compromised to give up stored data. With the MOBILEPASS device, however, the data is encrypted in the device hardware itself. ‘It is very, very unlikely that someone can break into the device. After programming the device with the key, there is no way to change the (decryption) key or read it out. Only the manufacturer has the knowledge to change the application,’ Strobl said. Using dedicated hardware, they can process fingerprints more quickly than a smartphone could, and it makes checks more hygienic because the procedure is contactless. In the future, the MOBILEPASS device could even be adapted with retina scanners to verify traveller identities using iris recognition, or infrared scanners to detect body temperature and flag those who may be crossing the border with an illness during monitoring of a public health epidemic. The ease of collecting such data portably offers possibilities to make borders more secure. Strobl says that passenger acceptance of such increased travel checks is all about matching speed with security.